Jessica Welborn’s physical miracle amazed everyone, but the emotional story-behind-the-story is just as incredible. The photo could be any one of a thousand snapshots from Gauntlet 2017. 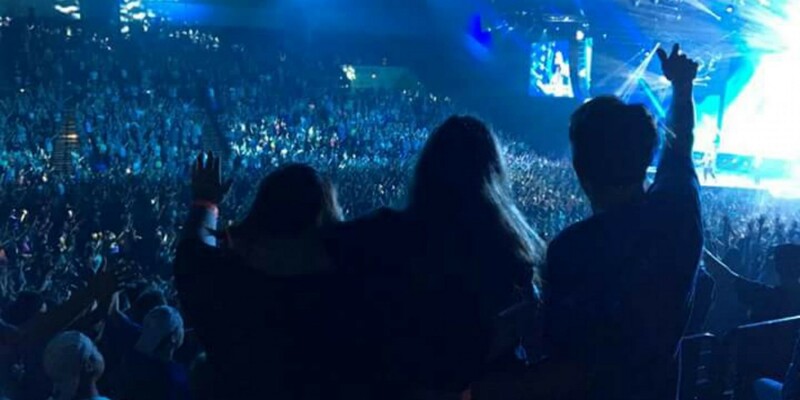 Three people are standing together, bathed in a bluish light, raising their hands in worship. But the moment it captured was like no other. The woman at the center, Jessica Welborn, had used a wheelchair every day for seven years. And there she was, on her feet. 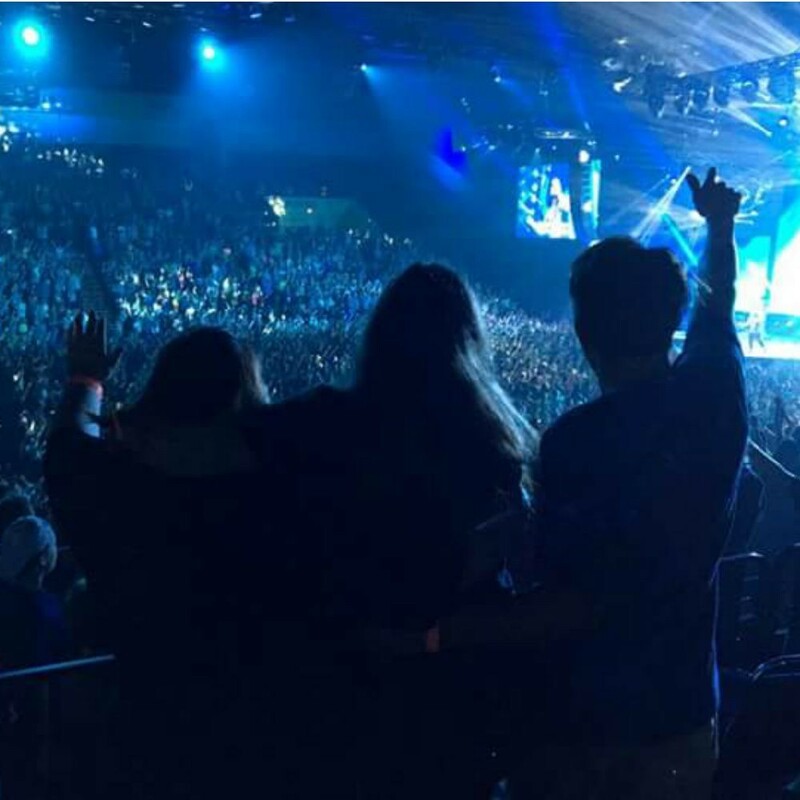 Jessica, center, stands between two fellow NewSpring volunteers inside the Ocean Center during Gauntlet 2017. News of the miracle bounced around in texts among her friends and fellow KidSpring volunteers for the first couple days. 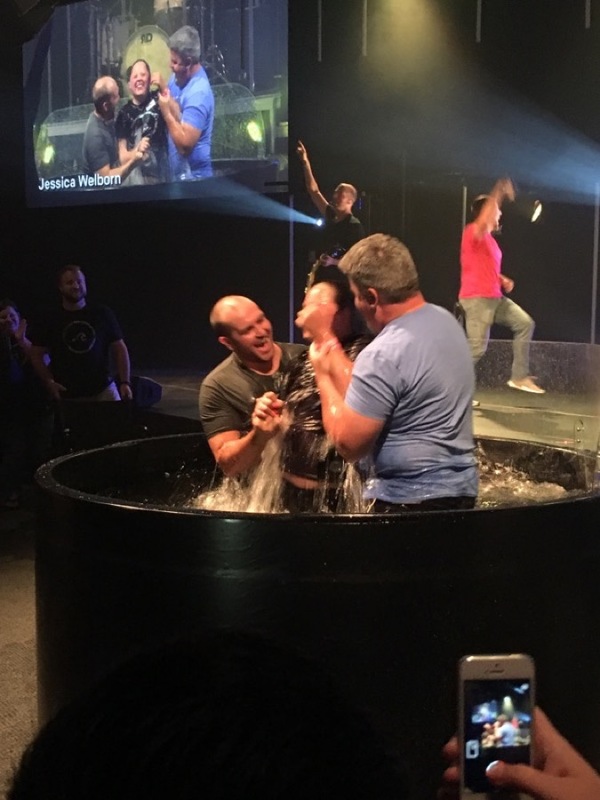 But Jessica’s story truly caught fire when it was highlighted during a Sunday service celebrating baptisms and stories of life change from the Gauntlet. Jessica was one of 674 people baptized that day, and she was overwhelmed by the sudden, unexpected attention, especially from her home campus in Powdersville. What happened was a miracle, she says, if not quite the modern day version of the healing of the paralytic that some assumed in all the excitement. Just like all miracles, she says, God arranged every detail to uniquely communicate His love for her and build her faith. And it was meant to grow the faith of those involved, those who knew her, and those who would see and hear what happened, too. “I don’t want this situation to be about me. It’s about what God did,” she says. Jessica isn’t paralyzed. She suffers from a rare, progressive neuromuscular disorder, Friedreich’s Axtaxia, an inherited disease that attacks her central nervous system and leads to a loss of movement in a person’s limbs. Doctors diagnosed the problem when she was 14 — when she was still a cheerleader and a soccer player. An aunt had suffered from the condition, so her family knew to expect. The symptoms were mild at first: She would lose balance and sometimes needed to hold onto a handrail to get up the stairs. The doctors couldn’t give her a roadmap for how the disease would progress, and it didn’t alter much about her day to day life through college at Lander University. She found herself holding on to the arms of her friends when she walked. Eventually, she would get so tired and out of breath, she had to rely more and more on a wheelchair more to get around. It was an amazing feeling. I was standing up straight. The transition to using a wheelchair happened gradually. There was no moment of realization this would be the last time she would ever walk. For the last seven years, she has just enough muscle strength to stand for a few seconds to transfer from a wheelchair into a car or into the shower. Then, her legs quickly begin to shake and she has to sit back down. Thankfully, her disease hasn’t progressed in several years. Ben, right, celebrating with Jessica at one of the Gauntlet 2017 photo stations. Doubt was Jessica’s immediate response when Ben Lucas approached her the first time on Wednesday night inside the Daytona Beach arena. Jessica was a volunteer chaperone for a Spring Zone student and she was surrounded by other volunteer chaperones and their students in the upper deck. 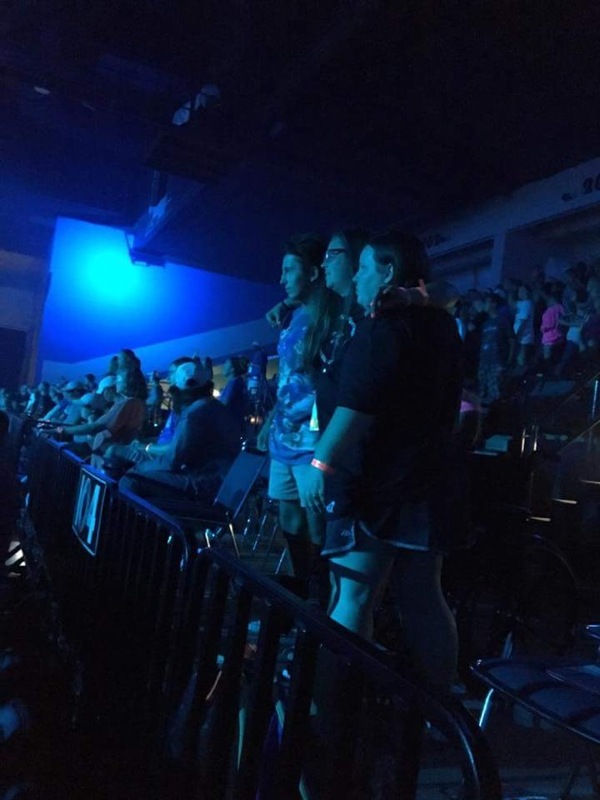 At one point in the special worship service, students were encouraged to pray for healing, and Ben decided to walk up to Jessica’s section behind where he was sitting. He recognized Jessica as a volunteer at Powdersville. He got down on his knees and touched her legs. “‘OK,’ Jessica said, but she was clearly skeptical,” Ben recalls. “Are you asking me or are you telling me?” Jessica responded. Jessica thought Ben was crazy. And she told him that. Her tone was almost mocking, she recalls. In fact, when Jessica decided to stand, it was to prove to Ben that her hip would slide out, and she would collapse. She stood up. Two seconds turned into 30, and 60. Maybe as much as a minute and a half? She didn’t feel any shaking. Ben was holding her hands lightly in front of her the whole time. Everyone around them was praying. The night before at Gauntlet, Jessica had decided it was time to renew her commitment to God. She had been holding bitterness in her heart toward God for a year and a half after the collapse of an engagement. She blamed God for allowing her to go through the emotionally wounding experience. Why did you let me do this when you knew it would end up like this? The relationship had left her wary of trusting anyone again. Inside her Gauntlet room, she knew she needed to let go out of the past and all its baggage. That’s why Ben’s boldness was part of the miracle. In her own faithlessness, Jessica had to trust again — and be vulnerable enough to try and stand, believing Ben wouldn’t let her fall. As she stood to her feet, God’s power proved not only that she could trust Ben, but that she could trust God, too. “I really did feel like Jesus was a promise maker and a promise keeper in that moment,” she says. 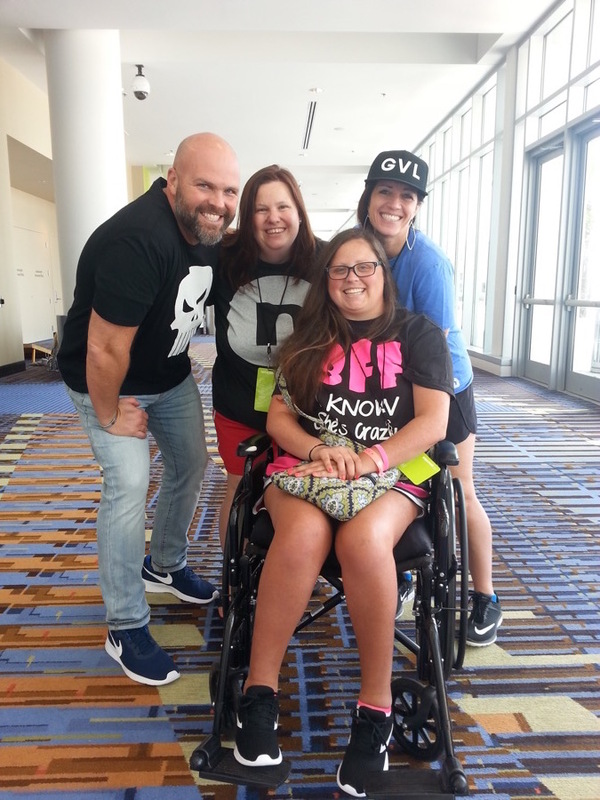 Jessica poses for photo at Gauntlet 2017 with NewSpring Teaching Pastor Clayton King, left; his wife, Sharie, right; and community group leader Kim, center. Kim was by Jessica's side the night she stood up out of her wheelchair. In the run up to Gauntlet, Jessica and her small group leader had been praying for God to provide clarity about her salvation and whether she needed to be baptized. Jessica had asked Jesus into her life in her late teens, and she had gotten more serious after connecting with NewSpring first in Greenwood, then Anderson, and now Powdersville. Jessica had realized the two-year relationship was a stumbling block on that journey. “I put my trust in a person instead of God and when that person let me down, I thought everyone was going to let me down,” she says. In the last year, serving as a KidSpring actor, attending a small group, and most recently, serving as a Fuse group leader and chaperone for a Spring Zone special needs student at Fuse, were signs of a newly flourishing faith. The miracle was the start of a journey to trust people. Although she was baptized at an earlier age, it was at Gauntlet Jessica realized she’d never gotten baptized as a way of publicly declaring in faith that Jesus was her Lord and Savior. 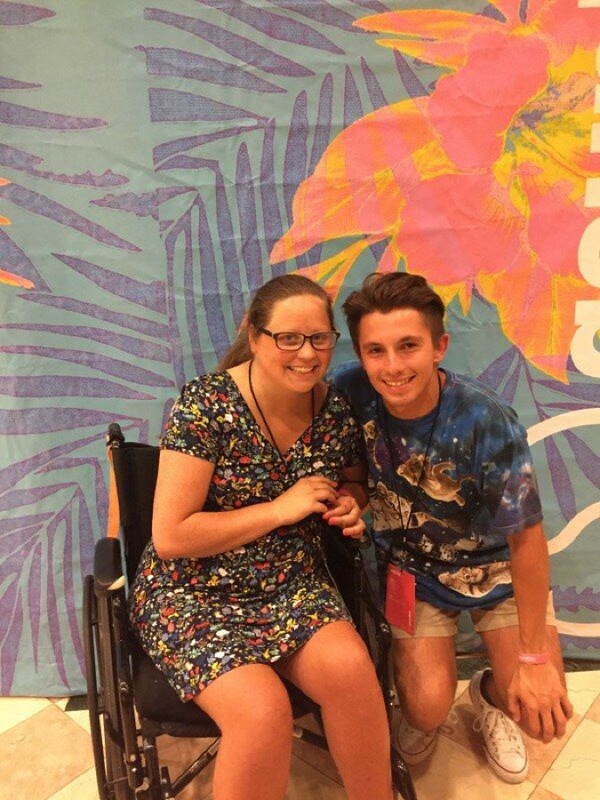 So on the Sunday after Gauntlet, at Gauntlet Session 8, Jessica wheeled herself toward the hot tub, let two staff members pick her up out of her chair, and then dunk her under the water. In the crowd was Jessica’s mom, her biggest cheerleader, witnessing the depth of the love for Jessica by so many people at this church, she promised her daughter she would begin attending the Powdersville Campus with her. Jessica declares Jesus is Lord and Savior in baptism as people cheer. Heather, Jessica’s small group leader, is amazed by the physical miracle, but the healing inside Jessica’s heart is magnitudes greater. Ben has prayed for and seen physical healing in ministry he’s done on the streets in the Upstate. He believes the Gauntlet miracle may only be the beginning of Jessica’s healing. Jessica can’t explain what happened inside her body those two days. Neither she nor her doctors can predict whether the disease will progress. Does she think she can stand again like she did at Gauntlet? She doesn’t know. She hasn’t tried it since. What she does know is God wants her to learn to trust. And if she can learn to trust the people around her, the way she trusted Ben, maybe God’s power will be with her in that way again. “It was the start of a journey to trust people,” Jessica says.